Ah the dreaded moment when you realise that your good friend could be more. But for colleagues like Kate and Luke, and indeed for anyone in a relationship who is taking it even remotely seriously, this is a diabolical dilemma of Everest-like proportions. Do you act on the tempting possibility of what could be, and risk sending the delicately balanced relational house of cards you have carefully constructed down all around you? Or do you do The Right Thing and leave the stone studiously unturned, fearful of what turning it over may set in motion? Quite a conundrum and one it takes drinking buddies Kate and Luke a, from all accounts, richly rewarding movie to come up with a suitable answer to. Drinking Buddies is widely regarded as a career high for director Joe Swanberg, who has fashioned a well-regarded indie career focusing on, in the words of indiewire.com’s Eric Kohn, “perpetually inelegant people in search of meaning in their lives as they often struggle to find romantic satisfaction”. In other words, real life people struggling to make sense of their feelings, and not always acting on them in the best way possible. But that is the very nature of being human isn’t it? Good theoretical intentions being fashioned into less than elegant real world action by people balancing a curiously messy mix of self-interest and deep regard for someone else. And that’s why I think I am going to love Drinking Buddies. Because let’s face it, who of us has ever got it right the first time around? 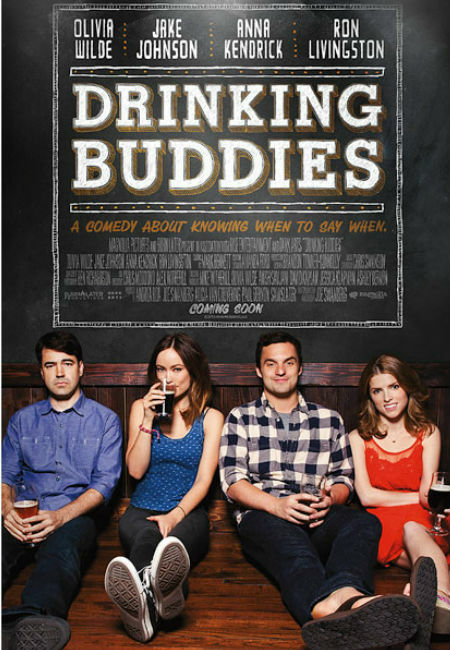 Drinking Buddies, which premiered at SXSW Film Festival on 13 March 2013, is available on VOD and iTunes on 25 July with wider USA release on 23 August this year. No word on an Australian release date yet.